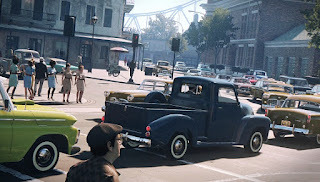 In contrast to the previous installments, Mafia 3 waits with more sporty vehicles, which bring substantially more speed into the game. Just like the weapons, the cars are modeled on original vehicles from the late 1960s. In addition, there are boats with which you can sail around the New Bordeaux. The cars range from muscle cars to smart sports cars. There are also off-road vehicles, which will serve you especially in the wetlands. The watercraft moves you quickly across the various rivers and canals. For the first time, you are moving through underground tunnel systems to eliminate your targets and build a successful criminal sync. The favors of the 3 underbosses always help you to have the right vehicle. The driving physics and the damage model of the vehicles were improved well. So you are moving around the dark streets of New Orleans. New functions such as the ram system are also available. For the first time it is possible to ram your opponents off the road. According to the developer, this should take some practice. Because each car is different, also the flooring and the weather changes the driving physics in Mafia 3. Also the drift behavior is to change per model and only to recognize if you drive a car over a longer period of time. Another new feature is the mirror that always sticks to the top of the screen. So you have your enemies and enemies always in view and can use targeted maneuvers to push them off the road. A target help also helps you during shooting while driving. So you will be able to hit important points on enemies faster. Shots on the tank cap or the tires are now more targeted. The tuning system has also been slightly modified. To get you cosmetic upgrades for your vehicles, you have to complete your race and win. There are different tires and rims as well as varnishes. You can customize the vehicle further by creating a personal number plate. The 3 underbosses will make you different, so you can give your vehicles a performance boost. In the following table, we show you all the perks and upgrades.